Music. Dancing. Free food and drink. Did I mention drink? All in a room full of engineers…? As it turns out, Denali Night Fever provided an excellent opportunity for a veritable who’s who of EDA luminaries and the rest of us just along for the ride to relax after a couple of long days at the DAC. 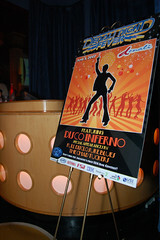 The event was held at the On Broadway Event Center just a few blocks away from the San Diego Convention Center. Music was provided by Full Disclosure Blues featuring Gary Smith and Aart de Geus, and Cadence’s Ted Vucurevich with The Chad Tuckers. Everyone’s favorite industry gadfly John Cooley was also present, earplugs and all, to serve as the judge of the “EDA Idol” competition. The party itself was a blast, but the more interesting question is whether the same held true for DAC this year. According to Richard Goering, there were 5,135 registered attendees, 3,796 exhibitor attendees, and 400 “other” attendees, for a total of 9,331 people. These numbers are down significantly from last year’s DAC in San Francisco, where presumably everyone and their dog went to the show as it was driving distance away, but they are also down slightly from the last DAC held in San Diego in 2004. Richard’s take was that there wasn’t much exciting going on this year at DAC, but I would tend to disagree. All four of us from Verilab who attended the conference were able to attend interesting product demos and sessions, and met up with people we otherwise would have had to travel far and wide to see. It also gave us a chance to catch up ourselves, as there were Verilab attendees from the UK and US who don’t always have the opportunity to meet face to face. Some of the info at the conference could have been gleaned from attendance at DVCon or DATE. The technical sessions at DVCon were consistently the most relevant to my role as a verification consultant. Its smaller size (710 attendees) made it a good “starter conference” to help kick off the season. DATE was good because it gave me the opportunity to catch up with current/former clients and colleagues of mine in Europe, and to get a better understanding of what the design and verification community in Europe is interested in, but the technical sessions were far too academic for my taste. DAC, on the other hand, was a networking paradise. A large number of people I wanted to see were there, including some unexpected surprises. I also broadened my horizons a bit more when looking at product demos and was able to catch some interesting stuff I’d missed at the previous conferences. Is DAC still relevant? For me, the answer is yes. Your mileage may vary. If you’ve never been to any of the major conferences (a situation I found myself in before this year), you’re missing out. My horizons have broadened significantly over the last few months. I’ve got a much better appreciation for the state of the industry, what tools and methodologies are available, and who to call if I need a helping hand than I did back at the beginning of February. This entry was posted by JL Gray on Tuesday, June 12, 2007 at 9:04 pm	and is filed under DAC 2007, News. You can follow any responses to this entry through the RSS 2.0 feed. Both comments and pings are currently closed. This report might be a perfect description of what is wrong/right with EDA now. EDA is almost wholly focused on the issue of verification now, not the process of design. And it’s become much more of a service industry thatn a product industry. Going forward, DAC should focus on what the industry does best. ESL belongs in accelerated computing and embedded systems conferences, DFM belongs at Semicon, and DVCon and DAC should merge. The industry has trifurcated. Interesting though. I personally found it nice to be able to visit with companies with products outside my area of expertise. As an example - I went to a Magma demo for Talus. Sadly - I was the only one there and couldn’t ask any intelligent questions of the presenters. But had there been others present I would have been able to learn from the insights of engineers in a field I would otherwise have very little reason to communicate with.